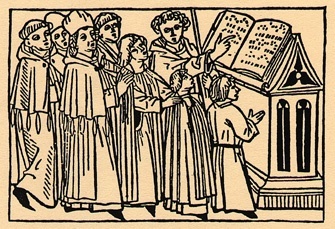 Sine Nomine (founded in 1991) performs the vocal and instrumental music of Europe transmitted in manuscripts from the tenth to the fifteenth century (or earlier, when it can be reasonably recovered). Concerts are structured around the music of a particular country, period, genre, or are thematically organized to allow for both depth of preparation and coherence in presentation. As historically-informed performance is best when evanescent sound is buoyed by learning worn lightly, so Sine Nomine strives to create a performance atmosphere both relaxed and informal, gently removing the barriers between audience and performer so often found in classical music. A complete brochure, including an order form and details of the current programme, is available. All concerts take place at Trinity College Chapel, 6 Hoskin Avenue. The Chapel (1955), “a lovely example of perpendicular Gothic,” is the work of Sir Giles Gilbert Scott (1880–1960), the architect of Liverpool Cathedral, the Cambridge University Library, and the famous British red telephone boxes. It is a most evocative neo-medieval space, and aurally and visually perfect for the performance of medieval music. The Chapel is located on the St George Campus of the University of Toronto, between St George Street and Queen's Park, within easy walking distance of both Museum and St George stations (map: https://tinyurl.com/y9c8fb9f). Tickets can be ordered from HartHouse tickets (https://tickets.harthouse.ca/Online/default.asp; 416-978-8849). To contact Sine Nomine, please call 416 638 9445, or write to Sine Nomine. Music figured prominently in the mysticism of the English hermit Richard Rolle (d. 1349). It's not surprising, then, that a body of music is attached to one of the manuscripts of his Melos amoris. Sine Nomine, in collaboration with Fordham University scholar Andrew Albin, explored the relationship between Rolle's text and the music which enriches it. A program of Latin recitations from the Melos amoris and songs from the Lincoln manuscript was originally performed as part of Sine Nomine’s 2015–2016 concert season. Recordings of this performance are available here. Sine Nomine has performed extensively in Canada, in the U.S., and in Britain, in concert halls, historic churches, art galleries, and museums. Sine Nomine has undertaken special projects in collaboration with musicians from other traditions. In 1997 Sine Nomine joined Mi’kmaq traditional singers Donna Augustine and Cathy Martin to present a different view of the Cabot 500 celebrations (concert broadcast on the CBC). Members of the group are part of the ongoing Alpharabius project with George Sawa and Suzanne Meyers-Sawa, to explore the ambiguous relationship of medieval European music with Arabic traditional music. Sine Nomine has made two recordings: Gaudeamus omnes: Medieval Music of the Saints (independent cassette, 1994), and A Golden Treasury of Mediaeval Music (Saydisc/AmonRa Records, UK, 1996). The group also provided music of the Middle Ages, Renaissance, and early Baroque for the CD–ROM designed to complement the BBS/PBS–TV series “Inside the Vatican,” with Sir Peter Ustinov. In 1997, an enhanced CD (containing both audio and multimedia CD–ROM material, and repertoire not included on the first release) was being issued as a companion to the original CD–ROM. Recordings by Sine Nomine can be ordered in Canada from SRI Canada, or in the United States from Qualiton. Performance practice scholarship is vital, however, if anything is to be accomplished in lifting notation from the manuscript to the ears through a convincing performance. Palaeographical, philological, musicological, organological, archaeological and anthropological resources are all necessary to recover what can be known of performance practice, and, more importantly, to understand how uncertain much of that knowledge is, and will remain. The scholarly resources of the Pontifical Institute of Mediaeval Studies, and of the University of Toronto at large, provide Sine Nomine with a stimulating and congenial setting to turn research into sound. Members of Sine Nomine were originators and organizers of the 1993 Annual Conference of the Centre for Medieval Studies on “Performance Aspects of Medieval Arts and Learning.” Members of the group are contributors to the Revised New Grove Dictionary of Music and Musicians (London: MacMillan, 2000), have given papers at academic conferences, and published variously in medieval studies in scholarly journals and elsewhere, including translations from medieval theorists on performance practice in The Sound of Medieval Song, Oxford Monographs on Music (Oxford: Clarendon Press, 1998). Sine Nomine performed at the second International Medieval Congress at the University of Leeds, in 1995. The group has also performed at several Centre for Medieval Studies Conferences (University of Toronto), in 1993, and 1995. In November of 1993, Sine Nomine was featured at the annual meeting of the American Musicological Society (AMS) in Montreal. The AMS concert was a winner in the Early Music America broadcast competition in 1994, and was heard on American National Public Radio’s programme “Millenium of Music. ” In 1997 members of Sine Nomine played in a concert sponsored by the Medieval Academy of America for the Academy’s seventy-second annual meeting (concert broadcast on the CBC).